Preheat oven to 350° F. Place granola bars into food processor or blender and process until you have fine crumbs. 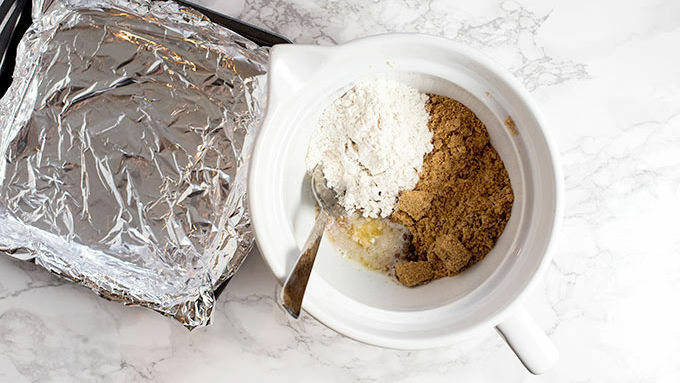 Add half of the crumbs to a bowl with flour, melted butter, and brown sugar. Stir to combine. Reserve remaining half of granola crumbs for topping. 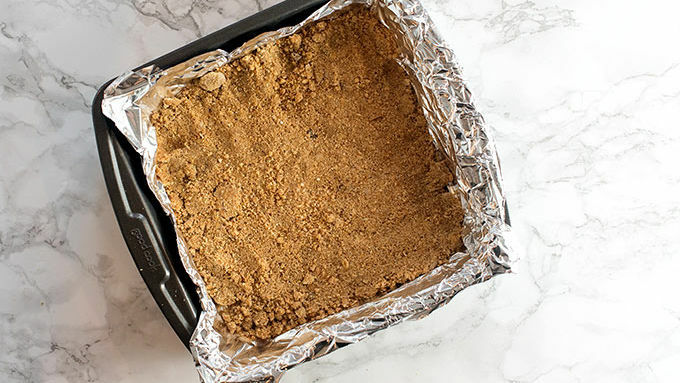 Press the butter-crumb crust mixture into an 8 x 8 pan lined with parchment or foil. Bake for 10 minutes and allow to cool. While the crust is cooling, let ice cream soften on the counter. 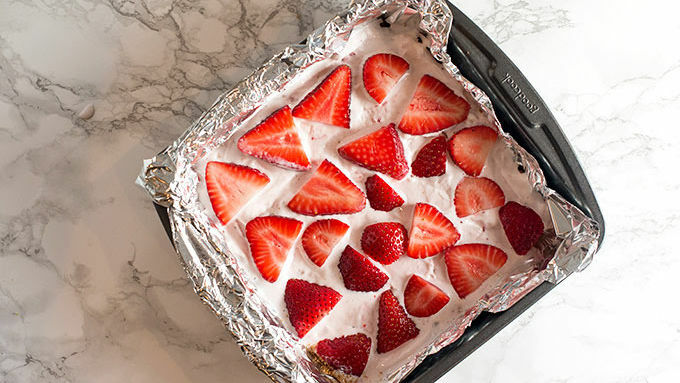 Spread soft strawberry ice cream over the cooled crust. Top with diced strawberries. 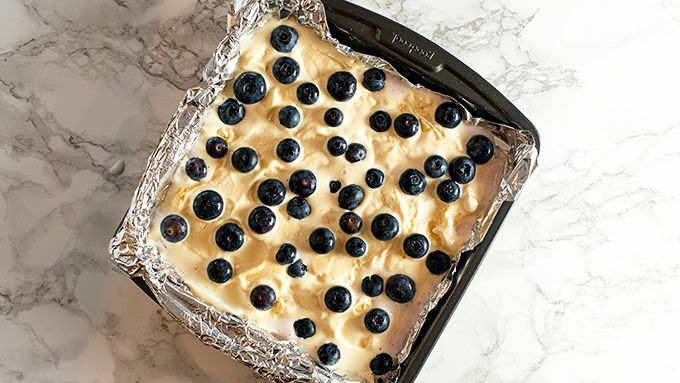 Spread vanilla ice cream over the strawberry layer, then top with blueberries. 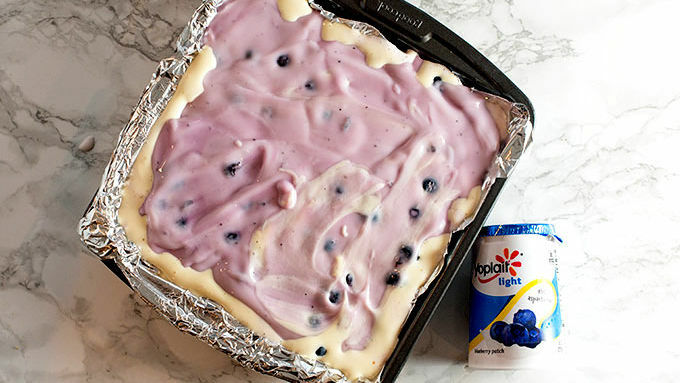 Spread blueberry yogurt over the blueberry layer. Sprinkle with reserved granola crumbs over the top and place in the freezer for 4 hours. 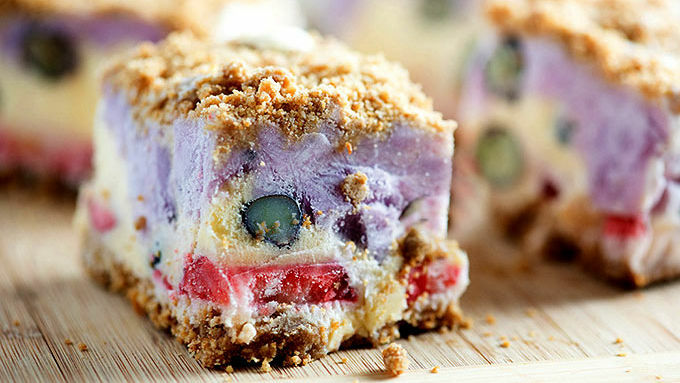 Yogurt, ice cream and berries all frozen together like the dream team they are. Let summer desserts begin! Two things very exciting are coming and I want to know which of them everyone is most excited about. Fresh, seasonal fruit. Orrrrrr ice cream? I know ice cream is technically a year ‘round thing, but it’s obviously made for the summer, so... Which are you the most excited about? 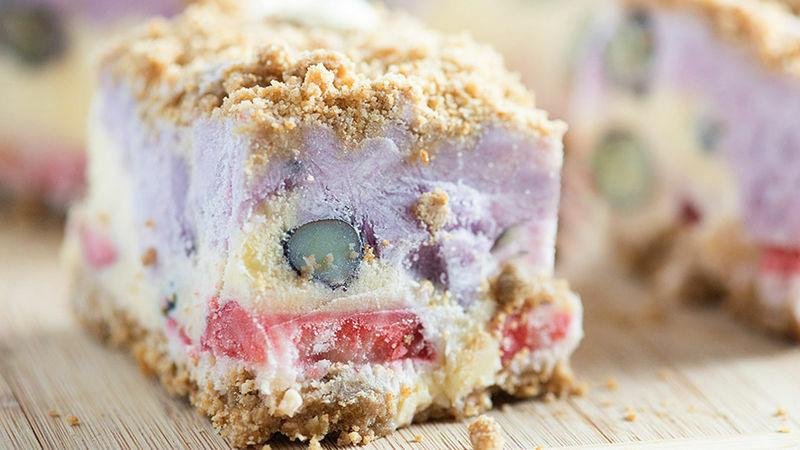 I personally can not choose, which is why I went ahead and made you a summer berry crunch cake that is loaded with fresh fruit, two flavors of ice cream, and some blueberry yogurt for good measure. The crust is made out of crunchy sweet granola bars. You’re going to need some ice cream, of course. Both vanilla and strawberry, please. You’ll also want Yoplait blueberry yogurt and some Nature Valley crunchy granola bars. Don’t forget the strawberries and blueberries, too! When you’re ready to serve, let it set on the counter for about 5 minutes to soften just enough to allow you to cut it. And then? Devour it all. Because, it’s all about summer!